Today’s game is an obscure adventure platform game made in 1994 by a two man company named Machination. The story is fairly simple at the beginning, you’re a journalist who has been framed and you find yourself in jail. 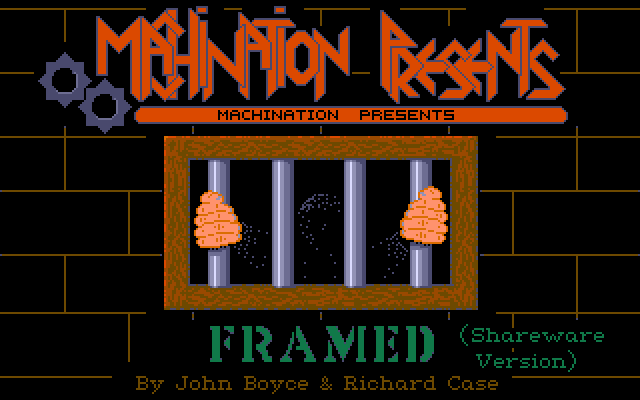 The first and shareware scenario is set within the jail, your job is both to escape and find any information about why you’ve been framed. 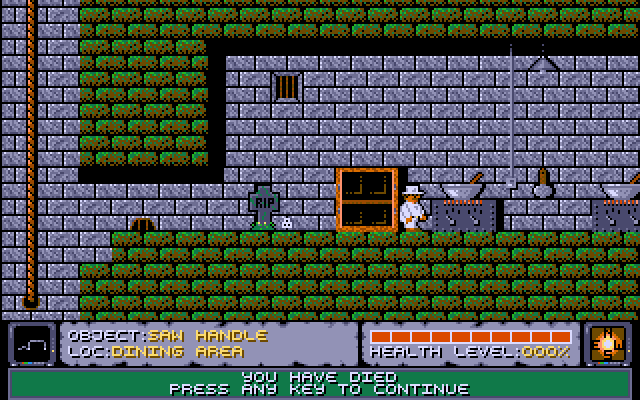 The game play is unique as it’s an inventory based adventure game but with conventional platform style movement and environment. The game engine supports VGA graphics, but only 16 of the 256 colours, which is exceptionally odd. Obviously this affects the art style which doesn’t appear to be as polished as contemporary games usually were. I don’t think the art work is bad, it does do a good job of setting the scene of a dreary prison space. There isn’t much animation apart from moving objects such as the enemies and the player, but the animation is nice enough and the level scrolls quite nicely. Sound Blaster, Ad Lib and PC speaker are all supported. The sounds are fairly basic, with simple sounds for actions like jumping, walking and being hurt. There is basically no music in the game other than the funeral march when you die and a short ditty at the title screen. Generally the game is fairly quiet except for the sound of your footsteps and the occasional boing noise when you jump. This fits fine with the prison scenario where a more eerie atmosphere is appropriate. The movement controls are fairly reasonable, although you press up to jump I didn’t have any trouble with movement generally. The other controls, which are used mostly for interaction with items, aren’t quite as easy to use. There are many keys that are spread around the keyboard. Luckily you don’t usually need to use them whilst dodging a hazard, so it’s tolerable after you get used to them. The platforming aspect of the game works fairly well for the most part, but has issues. Most enemies come in the form of guards, fireballs and spiders. You can’t harm any of them until you get the gun, so you have to dodge them where you can. The guards roam the levels in predetermined patterns, so you can exploit that to get past them usually, although there are some tight spaces where you basically have to take a hit to get past. The fireballs are emitted from broken pipes and will travel even when off screen. In one case a long corridor has one at the end, and you can have to dodge fireballs with no warning they are coming. The spiders look very innocuous being quite small, they basically wander around a small area looking like a background object. A small group blocks one particular space I found annoying. The scenario is basically one larger level representing the prison and it’s hallways connected to smaller levels by doors representing each section like the dining area. Items can generally be found in the area you’d expect to find them, such as food being found in the dining area. I found that there wasn’t much food (or other health items) around, so whilst the hazards are fairly sparse it can be quite difficult to stay healthy. I had hoped that the food in the dining area would respawn or that you could get healed in the medical area but neither was the case. 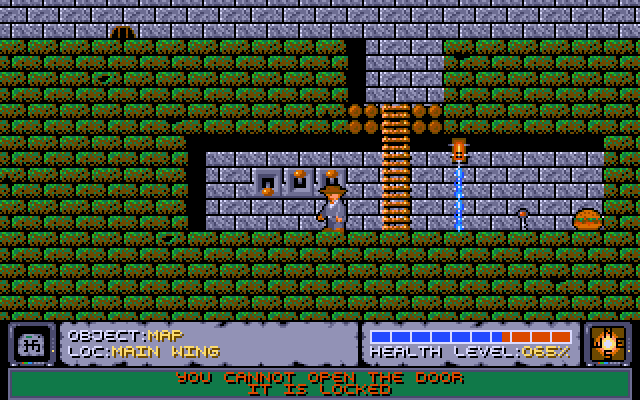 The adventure aspect of the game revolves around inventory item puzzles. The trouble is the story is very sparse, so I spent my time wandering around gathering random items as I found them, not sure of their purpose. There are a few missed opportunities to tell part of the story as you have to trade items with some prisoners, they don’t talk or request the item they want, and don’t say anything other than thank you when you deliver. The other prisoners are the only NPCs I’ve encounter so far. If I used one word to describe Framed it would be sparse. The main part of the level has long sections to travel between areas that could easily have been condensed. This makes both the platforming and adventure aspects less interesting as you spend a lot of time just walking around. If they had wanted to make the platforming more prominent, more challenges and health pickups would have gone a long way to making that work. Had they wanted to emphasize the adventure aspect they could have added more detail to the story through more dialogue, NPCs, and some prison activity to make the situation seem more active and to guide the player. That being said I don’t think it’s a bad game. The engine is well made and there is a lot to do within the scenario as a whole, just there’s a bit of walking around in between. After watching a play through it was clear how much I’d missed simply because there was basically no guidance on where to go next, no goals and no indication of what was required to reach them. A guide or walk through would probably make your experience better if you chose to give it a go. There isn’t any way to get the registered version anymore, but you can get the shareware version from the RGB Classic DOS games website.